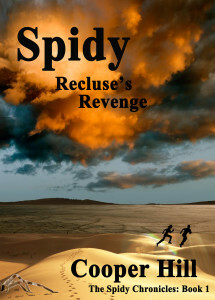 Born a prisoner of no worth in a desert land gone dead from the nuclear, betrayed, forced into drone service harvesting wah from seasonal mists in the Void, an unlikely heroine escapes mutant spidys, violent earth changes and a death sentence, to uncover an ancient secret. Hunted by the Assembly, haunted by a 400 year-old prophecy, Skoshi races against time in a world coming apart at the seams to unravel secrets left by the ancients and a promised freedom track. Wah-drone vets join to follow and protect her, the Outlander, and their Commander, Mika, as they seek a hidden cache of ships, forbidden knowledge and an escape across the salty billows. Only moments ahead of disaster, the band sets sail on the unknown billows, facing violent storms and wah-beasts trying to find a mysterious new land. But a strange people with different versions of their prophecy warn them away from a garden paradise and they are forced to race for their lives in the shadow of an erupting volcano. 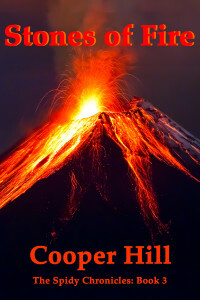 Will they find peace and a place of freedom or will they be consumed in Stones of Fire? . In a post-apocalyptic Australia, born a prisoner of no worth in a dystopian land gone dead and dry from the nuclear, betrayed by those she trusts, a young heroine, Skoshi (Lil’ bit), is forced into wah-drone service, a gatherer harvesting wah from seasonal mists in the Void. Her courage, spirit, wit and determination quickly draw a team of protectors and mates to her side. Chaos mounts as she escapes mutant spidys, a death sentence and violent earth changes that threaten to tear her world apart. Drawn into a vortex of danger, she and her team follow encrypted clues left by the ancients to discover a forbidden track to freedom, one that promises a new life in a new land across the Great Billows. But all is not as it seems and the betrayal runs deeper than anyone can imagine. Earthquakes rip through the wah-less desert of the Void, tearing deep jagged wounds through its heart in a post-apocalyptic dystopian Australia. Racing with the wind and against time, Mika, Stokes and Skoshi rescue stranded prisoners from certain death, running just ahead of escalating disasters that seem to shadow their every turn. Seeking shelter in the Outlander’s Enclave on the great salty billows, they are joined by hundreds of drone-vets who have quit their dwellings to follow them on the rumored freedom-track. Skoshi, Mika and Healer Sam uncover ancient clues to a 400-year old riddle and the trail leads to a cache of ancient ships for crossing the billows, with a vast storehouse of knowledge in seafaring, farming, building and freedom to prepare them for a new life in a new land. But ferocious storms and rumors of ancient plagues resurface, and as unseen forces drive them to the brink of despair, they are hunted, hounded and threatened by gatherers and Assembly guards. Just as escape appears within their grasp, an all-out assault by the City-brights draws them back into a disintegrating Void, jeopardizing their quest for Freedom. They’d found the cache of ancient ships, the supplies, and the means to cross the Great Salty Billows, escaping certain death and a horde of treacherous Assembly guards, just ahead of violent earth tremors on a crumbling continent called the Void. Leaving behind fear, oppression, death on the spidy nets and the only life they’d known for four hundred years, they sail into the unknown stormy seas, making landfall on an island of green and plenty. But paradise holds new dangers, with an impending volcanic eruption, warring invaders from the North, ancient prophecies come to life, and a new gentle people who are like children, having lost the memory of survival and thinking skills. Skoshi, Mika and Stokes lead their new-found companions away from the volcano and the invaders, to the South, following new remnant strands of the prophecy, seeking their promised land of plenty, and journeying into the Stones of Fire. 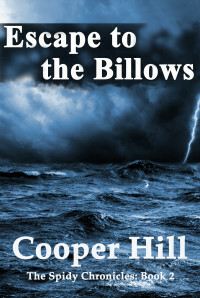 I hope you enjoy my books and become friends with their characters as they have become mine. Please consider leaving a positive review at your favorite bookseller. It is much appreciated!